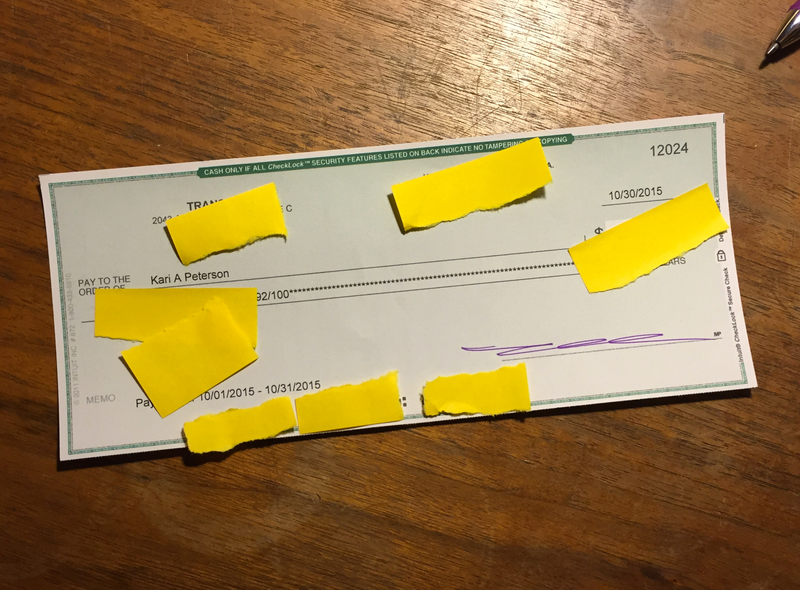 No, this one is a real paycheck, issued per a regular schedule, signed by a real boss, from a real company, with deductions and tax implications–the whole nine yards. I am a working stiff. Jim gets all perturbed with me when I take and post pictures of things that could compromise my/our financial security and/or lead me/us down the path to identity theft and financial ruin. I hate that, too. So hoping I did an adequate job of covering up all the salient, crook-worthy information. It IS a pay check under all the yellow stickies. Oh, and, modern member of the work force that I am, I took a picture of it (without the stickies) and deposited it right into my checking account! Just moments ago, from the comfort of my home office. You have to admit, that is pretty neat.